A tooltip is a simple concept. You put a tooltip on a WPF control and whenever the mouse hovers over the control WPF launches the tooltip. This article explores some of these idiosyncrasies in WPF. A tooltip is a simple concept. You put a tooltip on a WPF control and whenever the mouse hovers over the control WPF launches the tooltip. But things can get tricky when nesting control within a complex UI. Occasionally the expected tooltip might not appear. 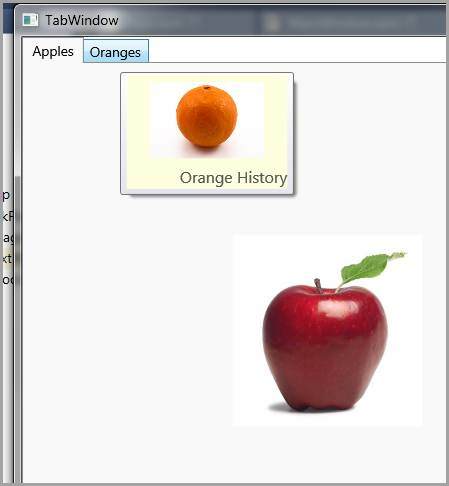 This article explores some of these idiosyncrasies in WPF. The basic rules of tooltips are simple. If a child element has a tooltip, that takes precedence over any tooltip applied at a parent level. 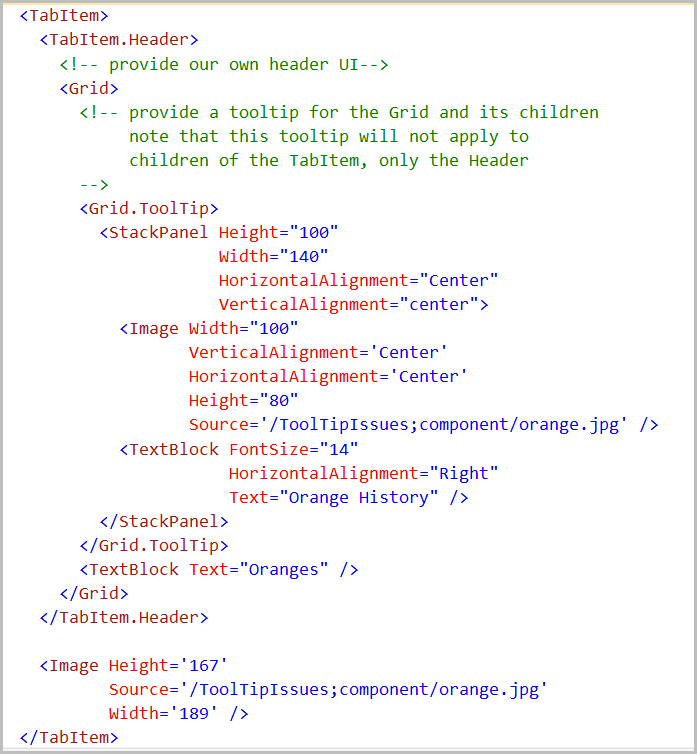 Take this XAML for example. Button1 and Button2 have their own tooltips. Button3 doesn't have one, so it gets the tooltip from the StackPanel. The last button has the most complicated layout in the example. The 1st image and the TextBlock (within the Button content) have their own tooltip. The last image doesn't have a local tooltip so it will use a parent one instead. 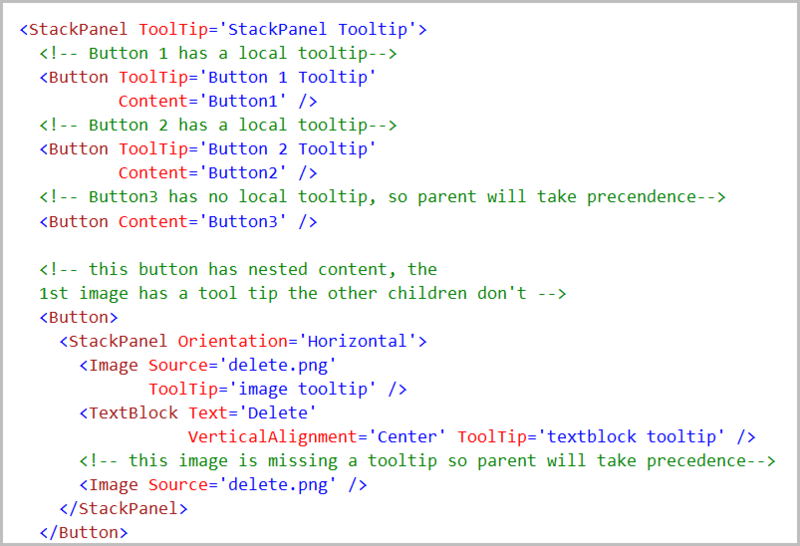 WPF will walk the tree looking for a tooltip, eventually finding one at the StackPanel level. Here is a problem I encountered on a project a few months ago. We wanted to have a preview tooltip for each TabItem in a TabControl. 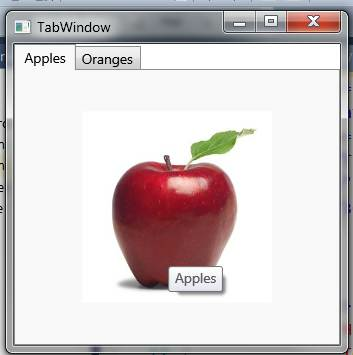 The tooltip needed to show up when the user hovered over the tab at the top of the TabControl but not when the user moused over any of the children of the TabItem. Here is an early attempt at a solution, but it doesn't work. This doesn't work for our scenario, because the Image gets the parent tooltip. The solution to the problem is to add some elements and tooltip to the TabItem header as in this example. Take a look at this last screen shot. I've got the Apples tab open. I'm holding the mouse over the Oranges tab (but haven't clicked on the tab). The preview tooltip appears. If I click on the Oranges tab however, the preview tab won't appear when I hover of the child controls of the tab.